A little play with a quote I found and photos of the flowers from my garden ! Bright and cheerful ( if not somewhat garish in colours ) for a sunny Spring morning ! Going out later for a spot of lunch at my friends Sue and Pete -- it will be good to catch up and no doubt a lovely lunch ! Love the poem -rhyme - garden words! I can se that your feelings have come through with these photos! A nice quote, Beryl. And your spring flowers look lovely. 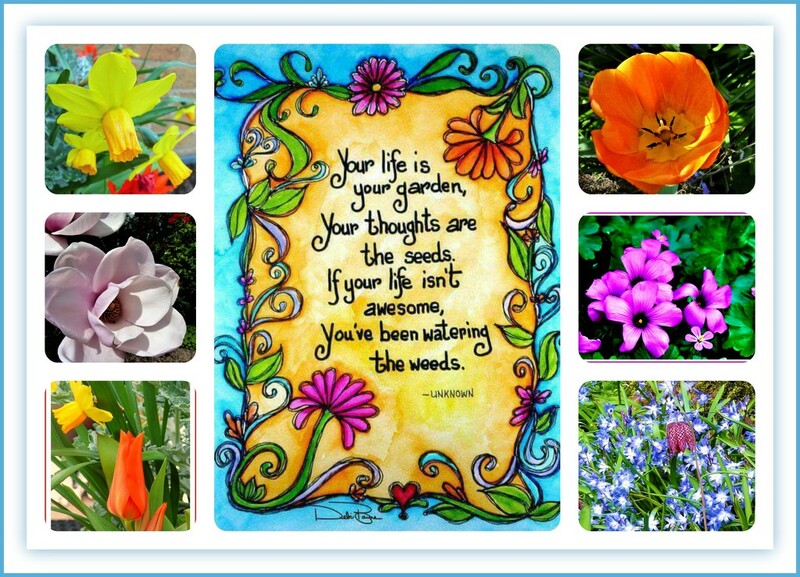 A great quote and a lovely collage of your flowers. Enjoy your day. I love this, Beryl! So perfect for life and beautiful flowers to accent those perfect words. Fav! Beautiful Beryl, the lovely flowers & the wise words. Wonderful collage and I love the poem. Fav! A great quote and lovely floral collage. A great true quote and a lovely pressentation. Fav. @ziggy77 Thank you ,but far from your gentle and delicate images --I must admit -- this is rather garish and in your face - I suppose there is room for both styles ! @beryl I love colour - which is probably why my passion is flowers - and for me it works as the flower image colours are echoed in the quote image . A great quote to go with these pretty flowers. Love the quote and the way you framed it with flowers. Beautiful result. Beautiful flowers and quote making a lovely collage.